I’ve arrived at the Sylvan Dale Dude Ranch just in time for an evening sing song. Everyone’s out on the main house back stoop listening to ranch owner Susan Jessup giving us a cowboy ditty. It’s the last night for this group of guests, many of them regulars, who’ve spent the week getting up to all kinds of western fun; riding horses, driving cattle, lassoing, and cooking the mandatory s’mores (that’s marshmallows to you and me) over a camp fire. The guests’ kids have full size roosters on their laps, the birds seemingly perfectly at home being petted. They are Susan’s personal pets I’m told. 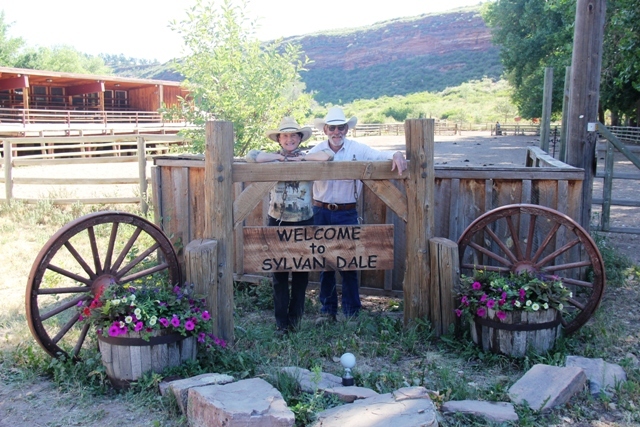 Sylvan Dale Dude Ranch is over 3,000 acres of prime Colorado land just outside the city of Loveland, an hour or so from the mile high city of Denver. 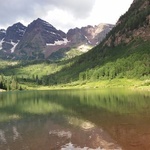 It’s also just a 45 minute drive from the Rocky Mountain National Park and the famous Trail Ridge Road. 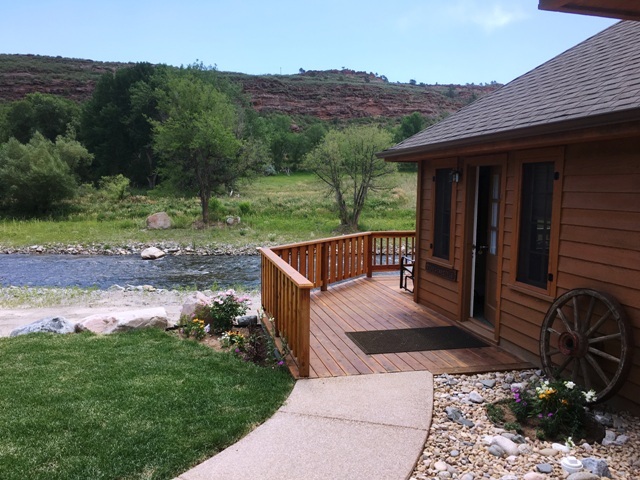 It’s been a part of the Jessup family for generations, the running waters of the Big Thompson River a constant companion and the Rocky Mountains on the doorstep, just a short drive away. I’ve always hankered for a chance to be a cowboy. Swapping my childhood make believe horse for a real one, with a big western saddle, a proper cowboy hat and a prairie, is any boy’s dream isn’t it? Of course, the luxury rustic riverside cabin, outdoor swimming pool and wifi are all welcome benefits, but just being a cowboy is all that really matters to me. 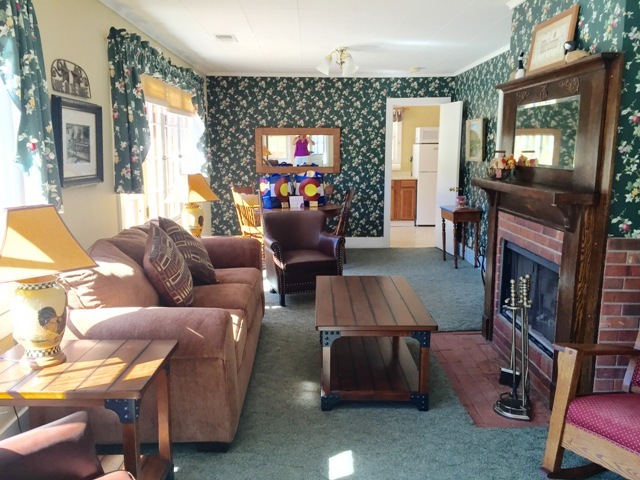 Having said that, the cabin is big enough for a two families let alone just me, with three bedrooms, a huge lounge area, an excellent kitchen and an outdoor deck complete with rocking chairs. Most people are here full board, so the kitchen is really not needed, but my coffee machine will certainly get good use. 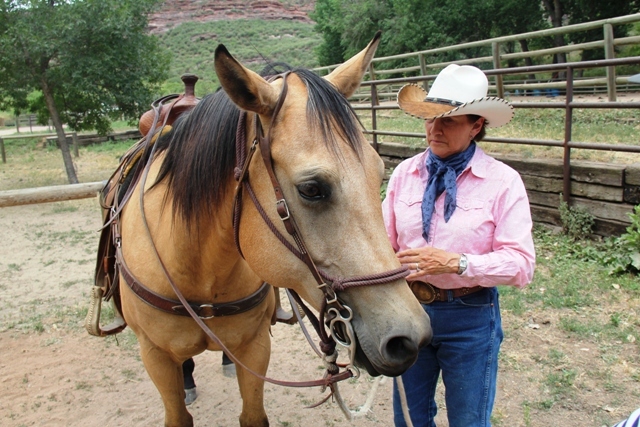 “Fancy a trail ride?” asks Susan looking remarkably lithe despite the fact she carries a senior citizen card. I guess that’s what years in the saddle does for you. I walk with Susan around to the stables and the moment Sparky and I lock eyes, it’s love at first sight. I am a riding novice when it comes to proper horse handling, but like all guys, I try to act like I have been around horses for years. Susan of course, sees right through this charade. Looking back, the hardest part was actually getting on Sparky. 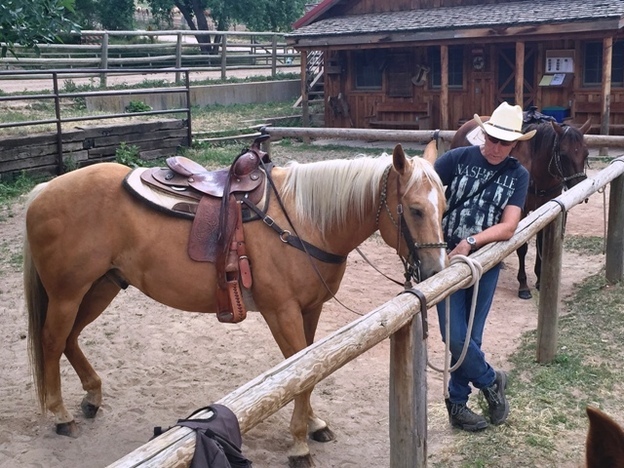 Having to stand on a wooden platform to mount my steed was hardly Jessie James, but brushing that aside, I really looked the part with my hat and jeans, gripping the bridle like a cattle duster. Susan takes me on a lazy climb up to the ridge overlooking the ranch. The views are magnificent and I start humming the tune to The Big Country. I am having a moment but Sparky is just eating grass. Seen it. Done it. Grass is much more interesting. I’m glowing with English pride. 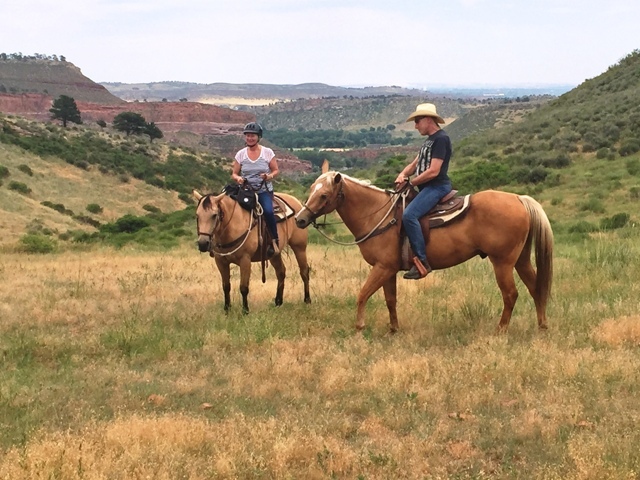 My inner cowboy is taking over as we mosey on, just the birds and the horses’ hooves for company. By the time we get back, I feel confident enough to forgo the platform and jump off myself and I perform the task like the seasoned rancher I clearly am. 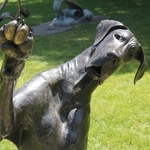 Sparky gives me a look and thinks yeah right, and wanders off for a drink. “Well done Andy. See you at dinner” says Susan over her shoulder , still looking impeccable as she strides off. 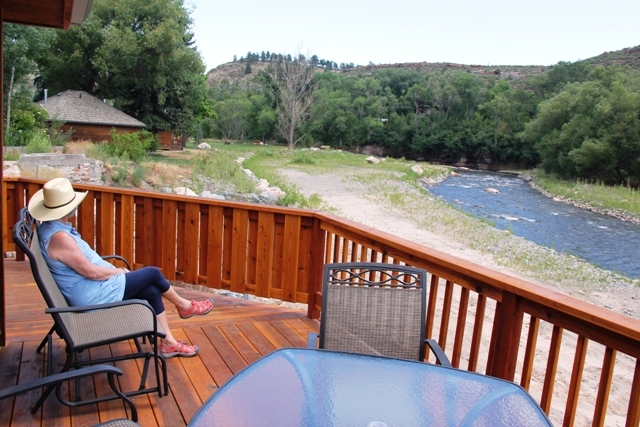 Back at my cabin I sit on a rocker out on the deck, sip a beer and watch the river run by within touching distance. This is a magical place. Dinner is a buffet affair up in the main house. Fresh no frills home-cooked food and all the drinks included. Afterwards we walk over to the stables again to watch all the horses being set loose for the night. The ranchers steer them along the track and open the gate to the giant paddock where they all take off free to roam at last. It’s a magnificent sight and I spot Sparky galloping in the middle of the pack, kicking her back legs out as if telling me, go on, try riding me now city slicker! As night draws in, we build a fire pit to make s’mores. Toasted marshmallows with melted chocolate squeezed between two wafers. It may not be healthy, but sitting there under the stars my inner cowboy is telling me it’s definitely the right thing to do. 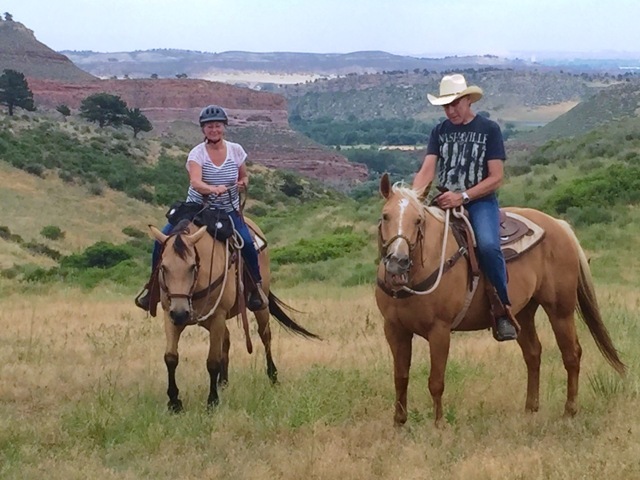 Packages from $1,595 per person for 6 nights including all meals, activities, western riding instruction and your own horse throughout your stay. 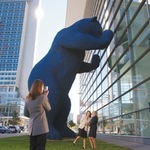 Go to Loveland and Colorado CVB for more details on visiting the state.